Origins of the design language formerly known as "Metro"
Metro UI (or "Microsoft Design Language" as it is officially named) refers to the set of software designs used by Microsoft. The earliest iterations of this design were seen in Windows Media Center for Windows XP Media Center Edition, but the digital interface really began to take off in 2006 with Zune. Zune was Microsoft's first premiere music service, software, and set of media devices. One of the most compelling parts about the Zune's interface was its focus on typography and content above chrome. Rather than being filled with glossy, round buttons or gradient-saturated menus, Zune's UI used text-based navigation and motion as primary design principles. Although Microsoft inevitably brought the Zune brand to an end, its legendary user interface would live on. Showcased in Windows Phone's live tiles, Metro's interface provides a unique "information at a glance" experience. Dynamic content that can be easily accessible makes information available when you need it, where you need it. This contrasts significantly with other operating system's use of static icons, that provide no dynamic information to the user other than the occasional use of a notification counter. Segoe UI (known as "Zegoe UI" in Zune and "Segoe WP" in Windows Phone) is the font family used in Metro. This sans-serif typeface was specifically chosen due to it's simplicity and clean, modern look. One variation of the design includes all-caps headings, with all non-caps subheadings. Text size also plays a role in UI hierarchy and design, removing the need for alterations such as underlining, italicizing, or bolding text. Where did "Metro" get its name? Metro UI is inspired by the variations of signs in the King County Metro transit system in Seattle, WA (not too far from Microsoft's headquarters in Redmond). Many transit systems utilize minimalist icons and large typefaces which catch the eye. How has Metro been adopted? Widespread adoption of Microsoft's design principles is evident in many other tech company's change in logo to a more flat design (including many competitors). Some of these brands include: a host of Google's services, like the brand itself, Google+, YouTube, Chrome, and others, as well as other companies such as eBay, Twitter, Foursquare, Tumblr, LinkedIn, Instagram, and many more. There has also been a spike in use of sans-serif fonts and flat designs in non-tech-related brands. Ironically enough, Apple's iOS 7 and HTC's Sense 5 launcher for Android also mimic many of Metro's design features. 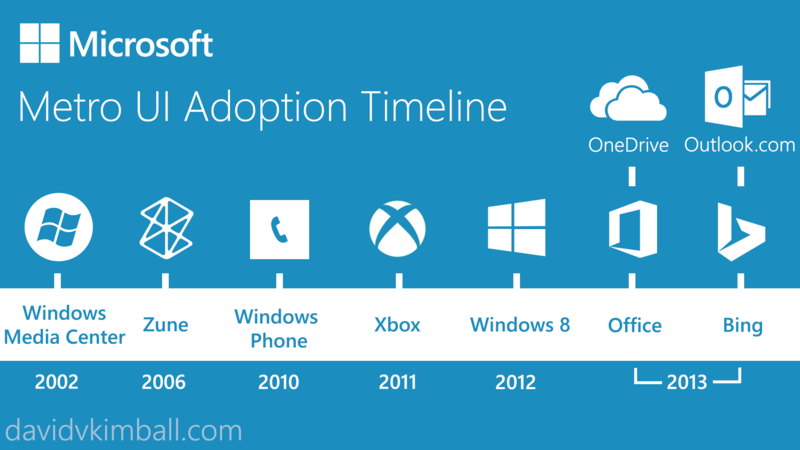 Microsoft is currently in-process for complete adoption of their own products to a Metro UI-eccentric design (see the adoption timeline below). After Zune, Windows Phone launched a new, championed Metro look-and-feel, which set the standard for the UI change of the Xbox 360's dashboard, Windows 8's Start Screen, and following the next year with Microsoft's Office Suites, Bing, OneDrive, and Outlook.com (formerly Hotmail). Even Microsoft's logo was changed to a flat design in 2012. I used to be a M$ basher back in the 90s, I used Win 3.1, 95, 98, ME, then moved to Mac OS 9 and X in 2000. As a graphic designer, I guess training has conditioned us to prefer platforms during the PC era. Now, I prefer Microsoft as my main computing ecosystem (I had my share of iOS and Android devices in the past few years and was not happy with Apple and Google). At work, we use Macs and Google ecosystems even though PC is ageing XP. Windows 8 is a breath of fresh air. I never complained for the lack of Start Button and Menu. The interface of Windows 8 is light years ahead of Android and Apple, and it seems everyone is copying Microsoft on this flat trend look. New Microsoft is the underdog I root for, not the M$ we knew. The Zune started it all, actually win 95 commercials did with their flat animations I remember as a teen. Windows 8 has a niche for developers, artists (freshpaint is cool), web designers, Xbox gamers. This is not for mainstream users since the UI is too futuristic to comphrend. I see a similarity to Windows 8 and the Commodore Amiga UI, esp. Snap View. Both systems were ahead of their time. The Robocop 2014 movie had elements of Modern UI with Bing Product placements in the movie. Windows 8 Modern UI is as close as we will get to Star trek LCARs and minority report interfaces if Kinect could be used on it. Microsoft is on the innovating edge, but mainstream does not see that and Microsoft will remain comfortably as third place for their customers like myself few far and between, not counting those who are still using XP, counting post-PC devices like PCs, tablets, and phones. Well said, Timmy. I couldn't agree with you more!